Quantum dots turn out to be small, useful balls of quantum goodness, much bigger than an atom, but pretty much smaller than just about anything else you can think of which is bigger than an atom. They are spheres that ring like a bell when hit by light, taking it in briefly, then emitting it again — but at a very specific frequency which depends on the size of the quantum dot and not much else. It is this that makes them useful. You pepper your sample with quantum dots of different sizes, spray a bit of UltraViolet light over them, & voila! red or green or blue light comes back. If you have artfully arranged to have the dots of different colors associate with different kinds of interesting chemicals or drugs or cells or whathaveyou, then you can see how things are ambling around down there. 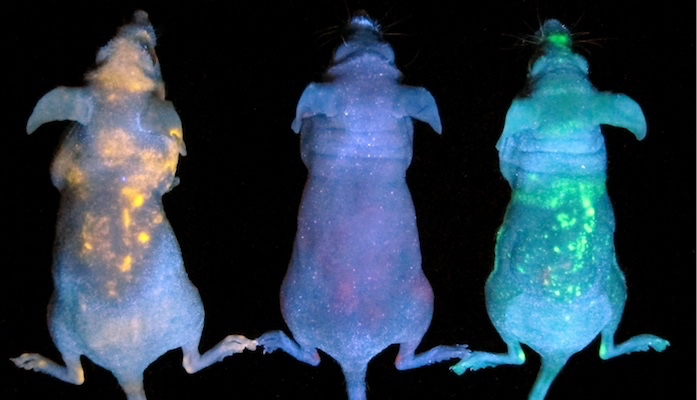 Cute, very cute, there is nothing like a mouse lit up by quantum dots. They get used a lot in televisions to help out with the colors. So you can pick up a supply of brightly colored dots at commodity prices. But the most interesting — at least to the humans who want to live longer & better — are the medical applications. And the day after my talk, Miriam had scheduled a panel on the very similar topic: Quantum Dots: Medical Applications. Turned out perhaps half the audience had been at my talk, survived, recovered, and now were armed with questions which I & the very knowledgeable & capable John Cmar & John Skylar had some quiet & informative fun with. Yes, there were three Johns on the panel! And no non-Johns. Get over it. After the initial confusion about how to refer to whom, we had a lot of fun with the back & forth, myself from the physics side, Cmar & Skylar from the medical side. I’ve put the talk up as a pdf on slideshare. Comments welcome! As always.